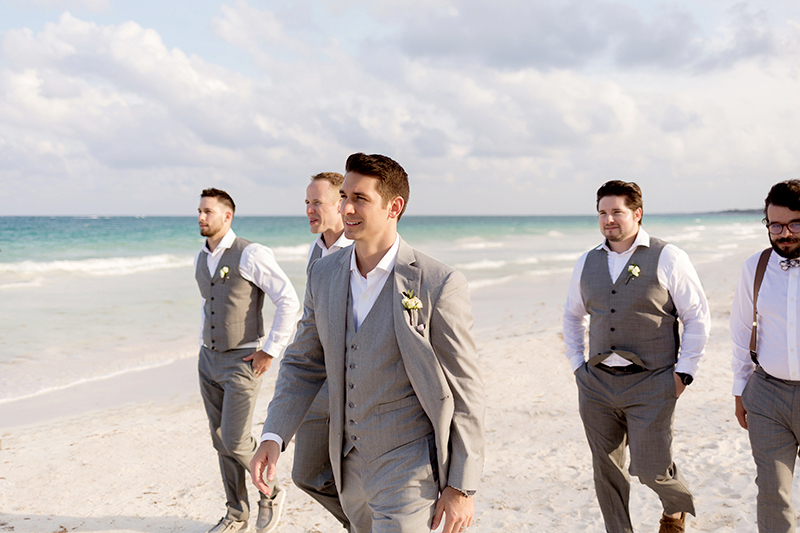 Staying 10 Degrees Cooler for a Cancun Wedding, for Men. Allow me to quickly set the scene… you’ve met the love of your life and together, you decide that a Cancun wedding is the perfect way to express your love for each other. It’s romantic, it’s memorable, a little mystical, and it’s tropical. You know that tropical equals heat, but more often than not, couples have no idea just how hot it is until they get here. 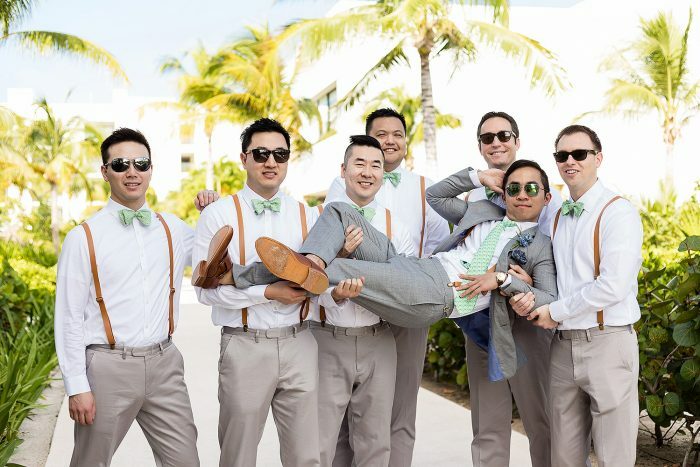 You have your perfectly tailored suit and your groomsmen are suitably attired, but before the ceremony even starts your big day becomes memorable for all the wrong reasons. That “cool ocean breeze” you heard so much about seems to be blowing hot air and you end up sweating, panting and generally uncomfortable from start to finish. As a Cancun wedding photographer, I am here to tell you that as picturesque as a Cancun wedding is, the heat can be completely unbearable if you are going to stand on the beach in a suit. High heat plus high humidity equals a lot of sweat and a lot of discomfort, especially if you’re wearing materials that trap the heat and hold it in. A simple 10 degree dip in temperature can mean the difference between tropical paradise and suffocating sauna, and while you can’t control the weather, you can control what you wear. Here’s a quick guide to help keep you 10 degrees cooler so the temperature is part of the back drop of your beach wedding and not the main attraction. A small amount of research will let you know what kinds of temperatures to expect at different times of the year. Yes, it is hot in Mexico all year, but certain times are hotter than others. This is true for any hot wedding destination. And it doesn’t have to be a massive project, just add it to the list of things to do during the planning phase of your wedding. Basically, it says that as humans we stay cool and avoid overheating by sweating. We get hot and sweat, then when that liquid evaporates it pulls heat away from the skin. In a humid environment, that doesn’t happen as readily and if you are wearing fabrics that don’t allow maximum air flow, it happens even less. That’s why the clothing you wear for a wedding at Cancun is so important. To help keep the heat factor under control, and for various style reasons, think lighter when choosing your beach wedding colours. Light colours such as white, beige and pastels tend to reflect the light and heat away, which is an important aspect of staying 10 degrees cooler. Also, believe me when I say you won’t want to be looking through your wedding photos someday and see yourself in dark colours on the beach… to me, it just looks wrong! Light is also the theme when it comes to the weight of the fabric. Wearing a fabric that is physically heavy will cause discomfort as the day moves along, even with lighter colours. The Real Men Real Style website suggests moving around a little in the store with the clothes on to get an idea of how manageable the weight will be. If it feels cumbersome in there, it will be a lot worse on the beach. Another requirement the Real Men Real Style article emphasizes is breathability of the fabric. This means quality air circulation to keep the moisture away, which means natural fibers. Cotton – every man is familiar with cotton in one of its various weaves, and it is a great choice if you’re in the heat and humidity. Cotton is affordable, it feels nice on your skin and it is easy to maintain. And as luck would have it, you can wear cotton for every piece of clothing on your body. Linen – this fabric is also light and breathable and has a texture that’s just a little different than most, for those of you who like that unique quality. It does have a tendency to crease and it can be costly, but it is your wedding day after all. Rayon – this fabric is made from chemically treated natural cellulose, and while some will argue it isn’t completely natural it still makes a suitable beach wedding material. Rayon won’t trap body heat and feels comfortable to wear. It doesn’t have a whole lot of durability, but you’ll only need to wear it once. It’s important not to forget about style when you set out on your quest to find light and breathable materials for your wedding wardrobe. Staying 10 degrees cooler is great, but staying cooler and looking horrible is not great. It’s not necessary, either. I’m lucky, because as a Cancun wedding photographer I get information on where to find the most stylish custom shirts that will work in your photos or anywhere else for that matter. Here are a few links to help you find some incredible shirts for yourself, or even better a nice gift for the guys standing beside you on your day. I hope you enjoyed and it helps you in your quest to be cool. Personally, I know I can use a little help every now and then!